If you never tire of hearing Doyle tell his stories of the old days of the road gamblers, where poker was for the most part illegal, with the constant threat of the game getting busted or hijacked, and the way he used to run over players by using his big stacks to intimidate them, then this book may indeed be for you. According To Doyle was a much bigger deal back in 1984 when it was first published, and this was even before his Super System, so it was pretty interesting and even intriguing to get inside the mind of a high stakes poker player. It’s a little less interesting today, especially if you’ve read other books by Doyle and are pretty familiar with his writing and his tales, which is all pretty similar across all his books. There’s a bit of strategy sprinkled in here for good measure, but for the most part it’s a collection of tales from the road which Doyle has since become famous for. 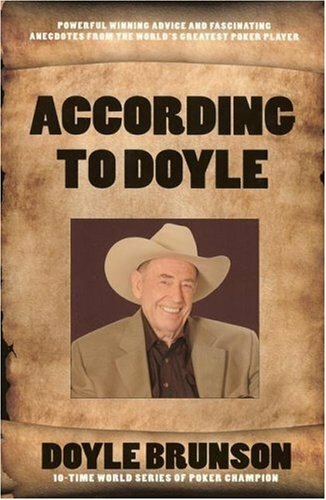 His stories are certainly interesting, although if you’ve read several of Doyle’s books, there’s quite a bit of overlap with them. This book is currently out of print and has subsequently been re-released as Poker Wisdom of a Champion, however that at least will prevent people from buying both and then complaining that they have two copies of the same book, which was true. Used copies are still available, so if you are looking to buy the updated version new, you can get the same book at a greatly reduced price by buying the original one used.